pic that I Google-Image Swiped. 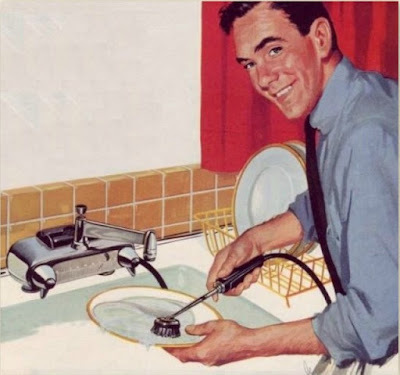 My writer colleague Debbie Fein-Goldbach just Facebooked me this following message: "I'm curious why you love doing dishes." She asked because I'd mentioned, on Facebook, that a few years back, I had suggested to a couple of magazine editors that they buy a story from me called "Why I Like Doing Dishes." but none of them bit, probably because: a) they didn't believe me; and, b) it was a dumb idea. "7 Reasons I Like Doing Dishes. Not as a paid job mind you but in my house. After we eat.)" 5) Mind you--over every corner of life, advice givers must hover--so if and when a busybody suggests an alternative method of drying (yup, I've been given tips on this very matter) you're required to hand him or her whatever towel or brush you're holding and say, "Here. You do'em;"
2) Doing dishes also taught me one of my go-to life hacks: "If you don't like doing dishes but get asked to do so, break one or two and you'll never be asked again;"
1) If you have dishes to do, it means you got food.